Here's a quick peek inside the world of Information Technology Services this week! Yesterday, we had our second Town Hall style meeting with CIO, Christy Campbell. After an overview and a few updates, each director was given the opportunity to speak to the department and nominate an employee who has been doing an outstanding job. Today, the Client Services team is participating in Customer Service training with a very knowledgable, experienced trainer. Their role of serving the faculty, staff, and students who call or chat about any issues is extremely important and we want them to have the best tools available at their disposal. 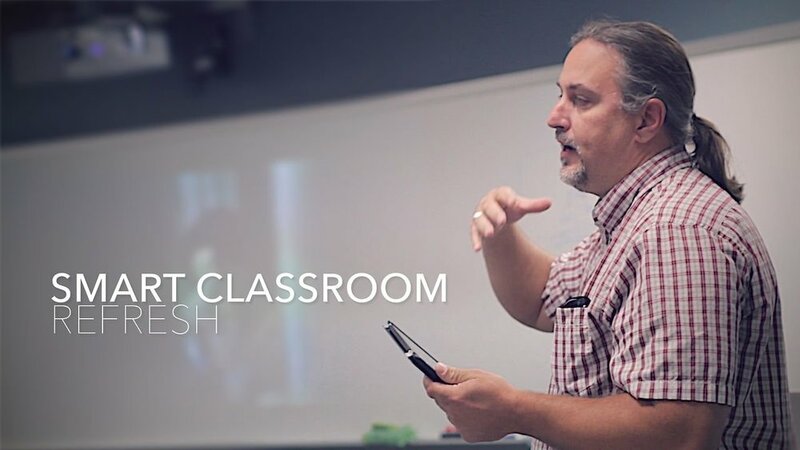 The Technology Department is testing a new breed of easier-to-use smart classrooms around the College. Ron Smith, AVP, Computing Infrastructure & Security Compliance & CSO, shows us around one of the new rooms at Kent Campus, one of the first campuses to get the new setup.